Terence Carter and Lara Dunston get their hands messy in a traditional Cape Malay kitchen and soon discover there’s no such thing as a free lunch. Halfway through our cooking course in the pretty Bo-Kaap quarter of Cape Town, a young man, attracted by the pungent aromas wafting from our kitchen, approaches the front door to the home of our host, Faldela Tolker, and asks for food. “Not now,” she tells him. “Can’t you see I’m working here?” He wanders off, chastened, but it’s clear this is not the first time he’s been attracted to this unassuming abode amidst the candy-coloured terrace houses of this neighbourhood, known for its kaleidoscopic buildings, cobblestone streets and quaint mosques. In South Africa, there’s a concept called ubuntu, Tolker explains. It’s about interconnectedness, being open and available, and about sharing. In practice it means that some days Tolker can end up feeding 30 hungry people. And it partly explains why she allows strangers into her home for cooking lessons arranged by fair trade travel company Andulela. Having said that, Tolker (or ‘Tyra’, as she cheekily sees herself as Bo-Kaap’s Tyra Banks) is clearly not one to be interrupted when she’s elbow-deep in roti dough. A skilled and organised cook, Tolker explains how she made a living for many years selling her home-style food to the lunchtime office crowd – until she became pregnant. She now teaches cooking to visitors who come for a taste of Cape Malay cuisine, culture and history. We listen to Tolker’s stories as we sip falooda, a lurid-coloured drink made from cow’s milk, rose syrup and falooda seeds. It’s a concoction Cape Malays drink to break their fast during Ramadan. It tastes of flowers and is delicious. The Cape Malay people were first brought to South Africa as Dutch slaves from South-East Asia – Indonesia and Dutch Malacca – and also southern India. After the British abolished slavery in 1834, most of the freed slaves settled in Bo-Kaap, which became a predominantly Muslim neighbourhood as the Cape Malays had brought Islam with them. What they also brought was their wonderful culinary history, and it still thrives today, with several of their dishes considered classic staples of Cape Town cuisine. Spices are central to Cape Malay cuisine and our cooking class started with a visit to the Atlas Trading Spice Shop, opposite Tolker’s house, with a guide from Andulela. Here workers rush about filling orders and stuffing brown paper bags with aromatic spices, scooped from jute sacks, destined for homes and restaurants across Cape Town. The spices play a starring role in our next dish, a chicken curry. Made with green chilli, garlic, ginger, curry leaves, fennel, coriander, cumin, turmeric and a dash of honey to counteract any bitterness, the aromatic dish is rich and heady. As an accompaniment, we quickly make a tomato and onion sambal by combining finely chopped tomato and onion with white vinegar, black pepper, salt, sugar, fresh coriander and Tolker’s not-so-secret ingredient: a dollop of apricot jam. Next, we tackle samosas. These delicious little fried savoury parcels are some of the best finger food ever invented, but we’ve never made them before as they always seemed too fiddly and deep-frying is messy. ‘Tyra’ gives us a withering stare worthy of a television soap opera, before instructing us how to make these correctly. While the meat and spice filling has already been prepared, it takes us a few attempts before we perfect the technique of making a cone shape with the pastry, and filling it with the right amount of mix, before sealing the parcel into its traditional triangular shape. It takes a while before our creations are considered worthy of their time in the fryer. The cooking soon winds up and we’re all sitting around Tolker’s dining table enjoying our morning’s work while her grandkids run about the house. The roti are amazing: light and fluffy, yet strong enough to wrap around a good chunk of fragrant chicken curry. 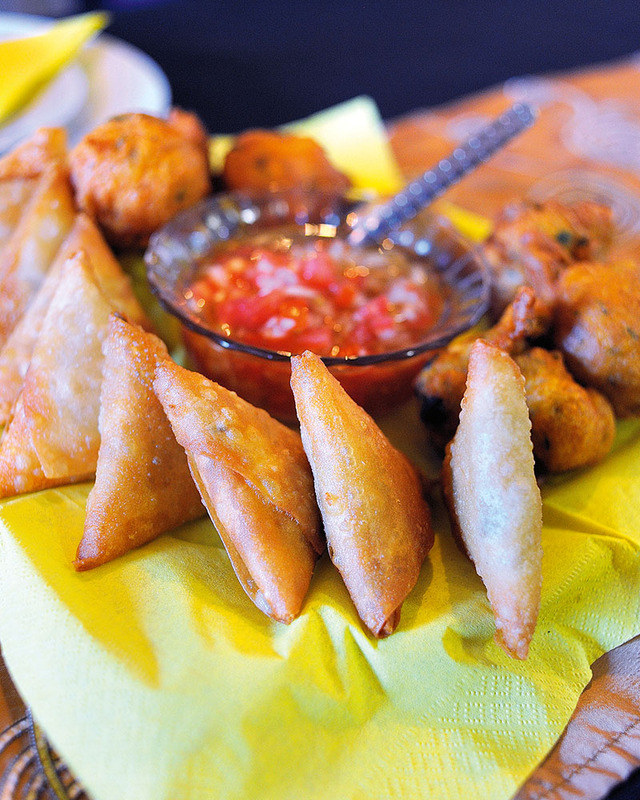 The chilli bites and samosas are the ultimate finger food: the heat and quality of the oil has produced fried food that’s not overly greasy and tastes fresh. As the Muslim call to prayer rings out, Tolker surprises us with a plate of koeksisters – sticky, fluffy, syrup-coated doughnuts that we wash down with perfumed tea. While we’ve learned a great deal about hearty Cape Malay cuisine, we’ve also learned a lot about ubuntu – through kneading bread, shaping samosas and sharing a stovetop together. Some locals fear that this once-poor neighbourhood is gentrifying and losing the flavour that gave it its soul. But as far as we can see it’s in safe hands, so long as residents like Tolker keep alive its culinary traditions, and the local spice shops continue to deal in such earthy delights. Just don’t pop around to Tyra’s place looking for a free feed while she’s busy. After all, even ubuntu has its limits. Combine flour, salt and baking powder in a large bowl. Add oil to mixture and rub it in with fingertips until crumbs form. Add water gradually and combine to create soft, elastic dough. Cover and leave in a warm place for three minutes. Take enough dough to form a tennis ball–sized shape and roll out on a floured surface to form a dinner plate–sized disc. Spread butter on the dough. Roll up the disc to form a cigar shape, hold at either end, then gently swing like a skipping rope until it doubles in length. Place the dough ‘rope’ back on the bench and roll each end inward to form two spiral ‘snail’ shapes. Place one on top of other, covering with tea towel for 30 minutes. Roll out each one to plate-sized flat discs. Fry in hot oil until golden brown on both sides for about two minutes. Once cool enough to hold, clap roti between hands. Serve warm with a curry. Tolker’s cooking class can be booked at andulela.com.